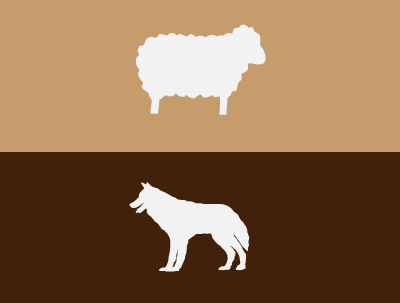 On more than one occasion I have seen this conversation move to the issue of “wolf hunting.” I’m not talking about hunting real wolves, (I wouldn’t have an issue with that ‘cause that sounds cool) I’m talking about the metaphorical process of identifying, confronting and eradicating “wolves in sheep clothing” in your church. Usually this conversation begins with some story about some church member that created “dissention” or was “rebellious” or, worst of all, didn’t submit to the “vision of the senior pastor” and it ends with an encouragement to be courageous and “protect the flock” from these threats. While the basic elements of this admonition match biblical metaphors I fear that the dynamic at play amongst pastors leads to a mis-application of the concept in the life of the church. If you really want to step into the role of wolf killer (a role I believe pastors are charged with in the bible) you have to understand who a wolf is, what characteristics identify a wolf and how wolves are eliminated according to God’s word. You can’t simply apply that title to anyone you want because ultimately you end up shooting sheep and protecting wolves. So first, who are the wolves? Although this is a direct quote from the Gospel of Matthew and are the words of Jesus, you have to understand the context if you are going to use this passage as a starting point to find wolves. Whenever Christ uses the analogy of sheep it is always with the understanding that He is the Shepherd. It is in this context that He uses it when He paints a picture of the end time judgement and the separating of goats and sheep (Matt 25), it’s in this context that he quotes the prophecy from Zachariah 13 about the shepherd being struck and the sheep scattered (Matt 26, Mark 14), and it’s in this context when he speaks of the Good Shepherd in John 10. Every sheep analogy implies the followers of Christ are sheep and HE is the Shepherd. This is important because when pastors co-opt Jesus’ terminology “ravenous wolves” in “sheep’s clothing” we are creating a subtle but profound shift from Christ’s intent. Pastors are assuming the role of shepherd in this description and the members of their congregation as the false sheep. It is implying, that if we are going to “go on a wolf hunt” we, as the overseers of the flock, have to look in the sheep pen. The problem with this is Christ is putting us, the pastors, in the sheep pen. He is saying there are those amongst the sheep that purport to be leaders, teachers, prophets who are false, who are the wolves. Christ begins the proper identification of wolves not pretending to be simply members of Christ’s fold but leaders among Christ’s fold. And this identification is consistent with the other occasion in scripture where we are warned against the threat of wolves in Acts 20. This amplifieth the grievousness of the evil, because there be some wolves within, and so hiding themselves under the title of pastors (elders), [which] do wait for some opportunity wherein they may do hurt. Also, he declareth what danger these wolves do threaten, to wit, the scattering abroad of the flock, when the Church is drawn away from the unity of faith, and is divided into sects. Neither are all those wolves who do not their duty as they ought, but there be oftentimes hirelings, a kind of men not so hurtful as the other. Paul is saying the ravenous wolves that pretend to be Christ’s sheep are the people who are leading the flock. That we pastors, when looking for wolves, should first look in the mirror. It’s easy to see this is true when you realize that many of the most dire warnings in scripture about threats to the church revolve around false teachers, false leaders, false prophets. (2 Peter 2:1-3, Romans 17:17, 1 John 4:1-4, 2 John 1:7-11, 1 Timothy 4:1-5, 2 Timothy 4:3). It is NOT about bad sheep, it’s about bad (under)shepherds. Yes, there are trouble makers in the pews. Yes, there are those who don’t follow well. Yes, there are those who make the jobs of pastors more difficult. But this is what sheep do. They bite each other. They wander away. They resist the leading of the shepherd. But the answer isn’t to shoot them or to throw them into the woods where they might starve or be devoured simply because that would make the shepherds job easier. Unruly sheep need to be shepherded not shot. They need to be cared for and pastored. They need to be nurtured and developed. It’s not fun, it’s not easy, it’s not glamorous, it’s not macho but it is the work of the Gospel to which pastors are called. In fact, the truth is, when we begin to treat the sheep as threats to OUR roles as shepherd we begin to display the traits of the wolf which we are called to eliminate.